The Drama Desk Award-winning 59E59 Theaters is dedicated to bringing exhilarating and illuminating theater to audiences in New York City with an appetite for new writing. They curate a year-round program of plays with over 30 live productions annually—6 days a week, 50 weeks a year. We worked with 59E59 Theaters to transform their old website into a robust tool that is as sleek and contemporary as the work presented on their stages. Ground-breaking theater has never been more accessible. 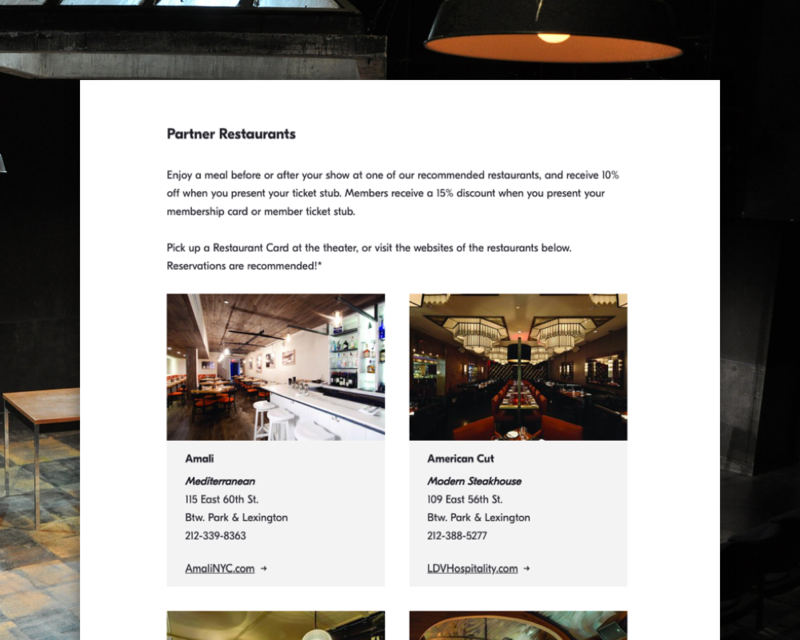 59E59 Theaters engaged us to reinvigorate and modernize their existing website. It was their goal for the site to more accurately reflect the caliber and diversity of their programming, and to be a more efficient tool for their B2C transactions. We redesigned their site from the ground up, moving to a more flexible Django CMS platform and migrating years of production archive materials, as well as integrating the site seamlessly with Spectrix's ticketing and marketing system. With 3 stages, showing 6 days a week, 50 weeks a year, 59E59 Theaters is an incredibly vibrant and active performance space year-round, with over 2.5 million in annual ticket sales. 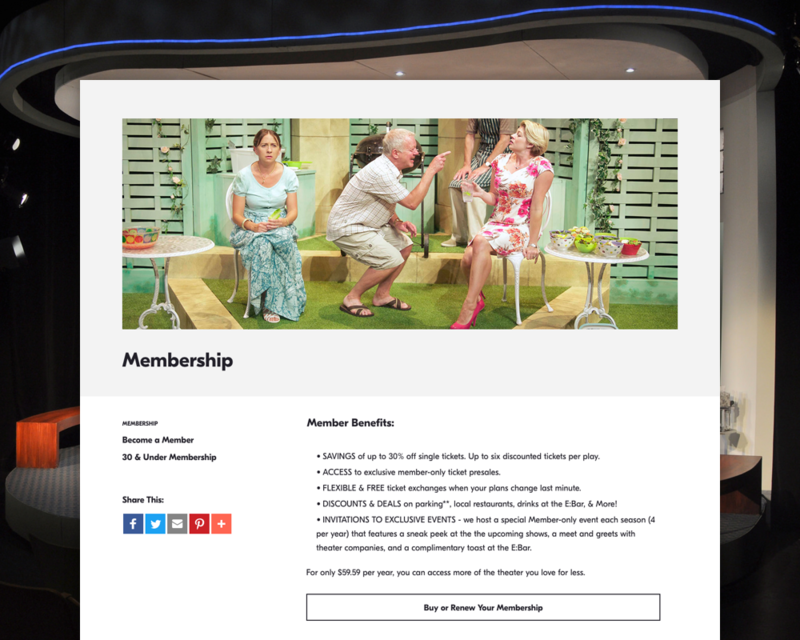 Because one of the main goals for the new site was to drive ticket sales and memberships, it was imperative that from the very beginning of the project, we work with 59E59 Theaters identify a launch date for their new site that would produce the least amount of disruption to their sales. From there, we were able to tailor our processes and create a roadmap that would guarantee we'd meet our goals. 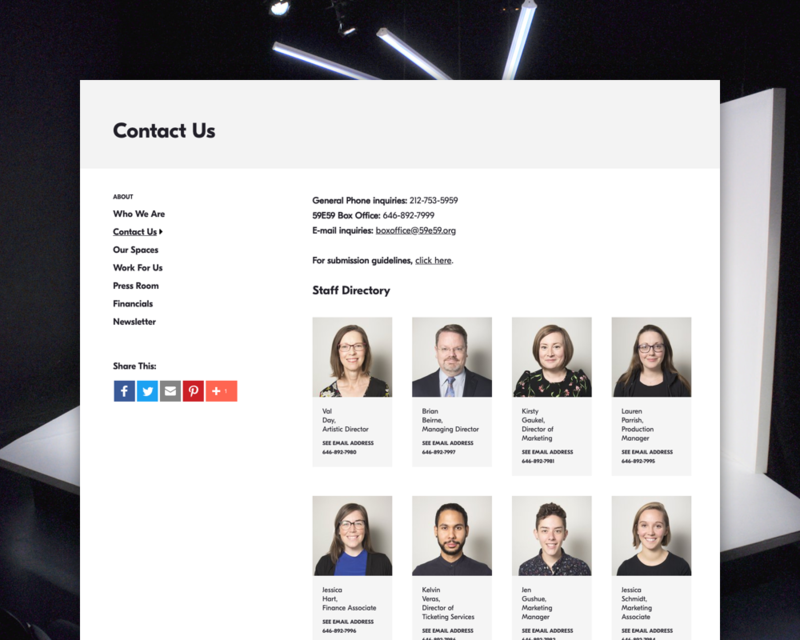 59E59 Theater's dedication to providing accessible theater is inspiring and we wanted to be sure that their newly designed site reflected the same values. Along with a modernized look and feel that serves as a platform for their brand as well as their shows, and all of the all the essential features of a state-of-the-art theater website, we also implemented WCAG 2.0 AA best practices. A compliant site ensures that more patrons have access to the brilliant work that 59E59 Theaters presents. Ranging from emerging and established theater company productions, to world premieres, every performance at 59E59 Theaters is new to New York. As such, the supporting materials for each show vary wildly. Flexibility was needed to host a diversity of content such as producing company information, cast and creative team bios and headshots, interviews and press quotes, supporting photos and video, and brochures. Our resulting show detail template is highly adaptable and features customizable content sections and plugins, as well as a banner color picker for complimenting show art, allowing each show past or present to feel like its own unique page. With three theaters running active shows simultaneously and over a decade of performances in their repertoire, it was important that mechanisms for searching and finding shows were prioritized. Our dynamic show calendar and date picker is a powerful tool for finding an upcoming performance to attend and sticky "Buy Now" buttons on current show pages make ticket selection easy. Once a show has finished its run, it automatically rolls over into the archive, where filters and keyword searches make browsing through past shows a breeze. Upgrading the website to a modern CMS that is efficient for staff to update was also a driving goal of this project. 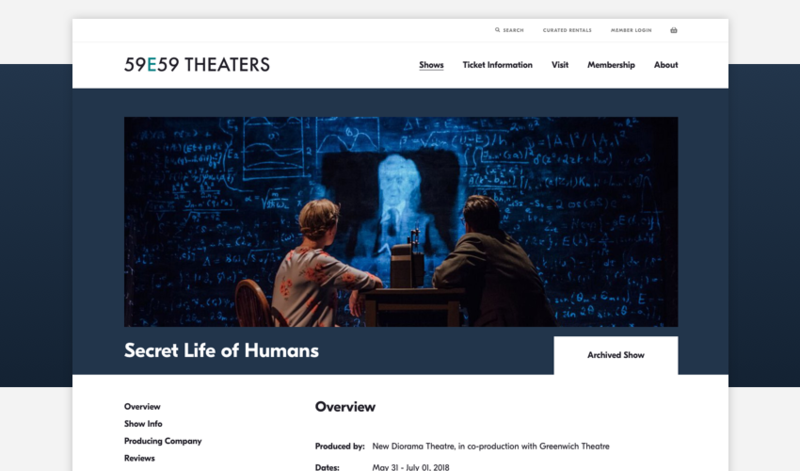 We built the new 59E59 Theaters on Django CMS, which is user-friendly for even non-technical staff to continuously update, arrange, publish and distribute content across a variety of templates and plugins. We were also able to streamline a migration of a vast archive of over a decade of production materials into the new CMS, greatly reducing the need for content entry. Integrating Spectrix with the new site meant we were able to leverage their API to pull in show content and details directly from the ticketing system, eliminating the need to manage show details in multiple locations. The key goal of this project was to make the website a more efficient transactional tool and to simplify customer pathways for purchases. To that end we worked closely with our friends at Spectrix, to seamlessly integrate their ticketing and marketing platform with the new site. Designing a more intuitive and use-friendly process for purchasing tickets and memberships means less customer confusion, resulting in fewer transactions being done over the phone or in person at the box office. 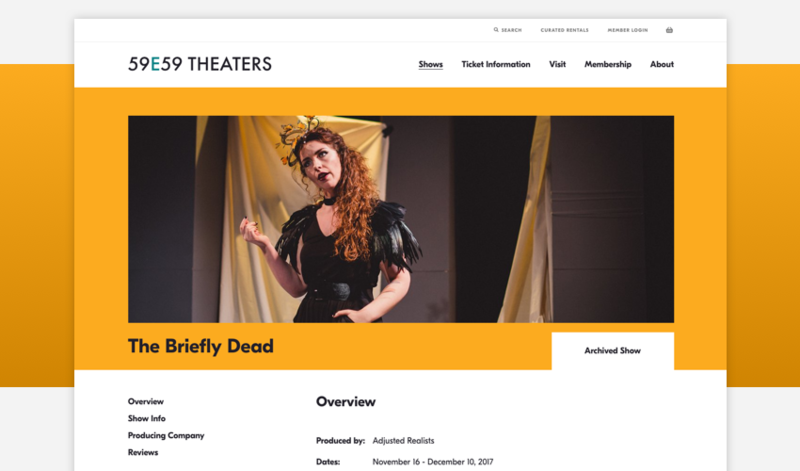 Both as a platform for elevating the production companies who bring their work to 59E59 Theater's stages, and as a more efficient system that has revolutionized their sales process, the new website with Spectrix integration has proven to be a valuable marketing and business tool for 59E59 Theaters. The module is live at OATH facilities in every borough, lessening the financial and administrative burden on the city, engaging citizens on issues of civil justice and quality of life crimes, and bringing awareness to personal behavior through interactive learning.